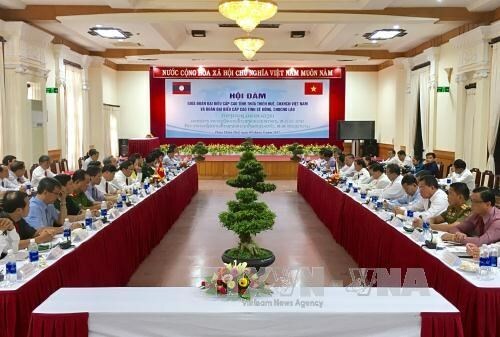 Thua Thien – Hue (VNA) – Leaders of the central province of Thua Thien-Hue and the Lao province of Sekong signed a Memorandum of Understanding (MoU) on cooperation in various fields during their talks in Hue city on August 9. Accordingly, the two sides will facilitate the exchange of regular high-level visits. In the near future, Thua Thien-Hue province will help Sekong with short-term training courses on Party building and share its operation experience of the People’s Council. They will continue raising public awareness of strictly implementing an agreement on Vietnam-Laos land border and border gate management regulations, and a Protocol on Vietnam-Laos borderline and border markers. Thua Thien-Hue and Sekong provinces will continue effectively deploy a model of village-village twinning relations in border areas and assisting local firms in trade promotion activities held in each locality. The two provinces will jointly hold cultural exchanges and boost educational and health cooperation, under which Thua Thien-Hue will provide 10 full scholarships each year for Sekong students and offering health checks-up to residents in border areas. Sekong will help Thua Thien-Hue enterprises seek business opportunities in Ka Lum district. Over the past years, Thua Thien-Hue and Sekong have regularly held friendly visits, unearthed and repatriated remains of Vietnamese soldiers, experts and voluntary soldiers who sacrificed in Laos during the war. Since 2002, Thua Thien-Hue has created favourable conditions for 110 Lao students to study at local universities and colleges. Since 2009, the Vietnamese locality has annually offered 10 full scholarships to Sekong students.